This spacious, upscale home is ideal for summer vacations, family reunions, anniversaries, golf outings, fall weekends, or special events. 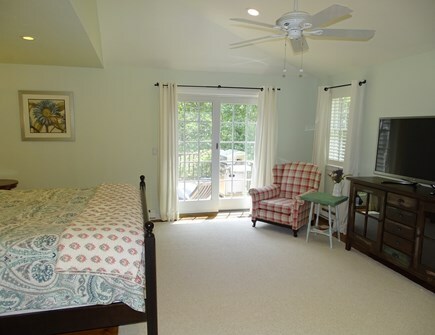 Nestled within a quaint village by the sea, our 3200 square foot ten room home (sleeps 10) is situated in a very private setting on three acres of beautifully landscaped grounds. A long driveway and three car garage provide plenty of room for boaters with a trailer. The property borders on conservation land with hiking trails. 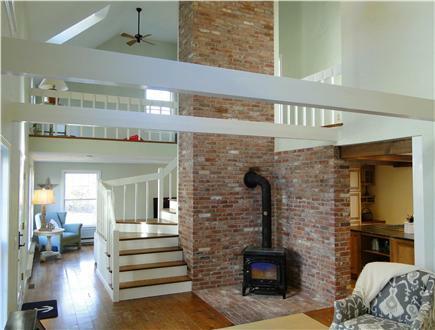 Within a mile of Barnstable Village and a mile and a half to the harbor, this spectacular get away offers the best of indoor and outdoor living. 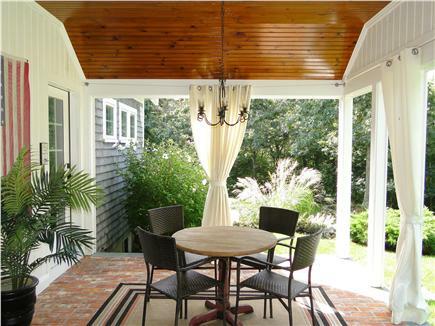 This fabulous location is convenient to all the Cape has to offer. Your beach pass sticker allows access and parking at 10 beaches, 4 ponds and 1 lake-all within 15 minutes. Walk to the Village for morning coffee at Nirvana, provisions at Barnstable Market, or breakfast at the Blue Plate Diner. 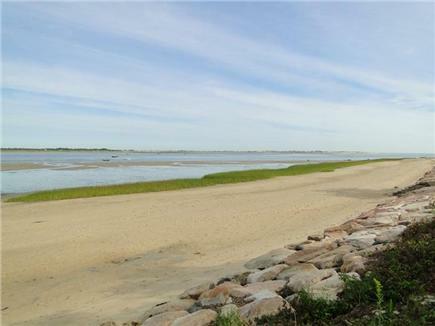 Afterwards, its a short walk to Barnstable Harbor with boat launch and Millway Beach. Relax on the beach or choose between deep sea fishing or a Whale Watch. 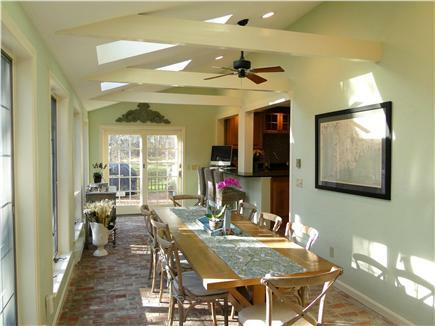 Several golf courses are nearby, and bike paths and hiking trails are right out your back door. Our house features three different outdoor living areas including a deck with a dining table and gas grill, a stone patio with Adirondack chairs, and a unique must-see outdoor living room which has couches, a dining area and a brick fireplace — the perfect spot day and night for coffee, reading, conversation, browsing the web, cocktails and hors d'oeuvres. The expansive back yard is great for outdoor family games and activities of all kinds: volleyball, croquet, corn hole, whiffle ball, badminton, etc. Or, just lie back and relax in the hammock or swing. 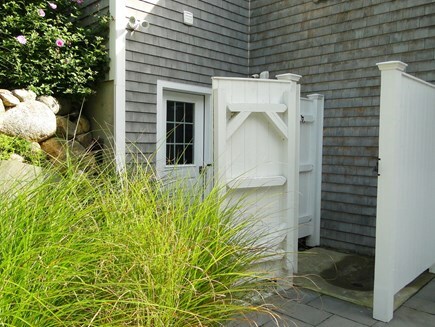 And don’t forget about the outdoor shower… such a plus! 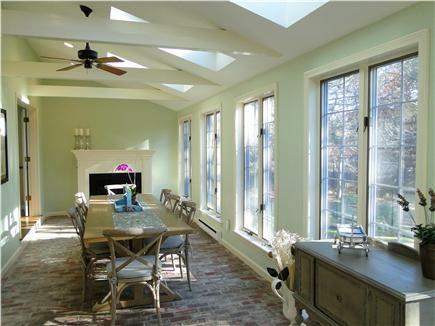 Inside, enjoy the sun splashed open floor plan. Prepare your meals in a true chef's kitchen with a Viking stove and oven, oversized refrigerator/freezer, granite countertops and lots of prep space. 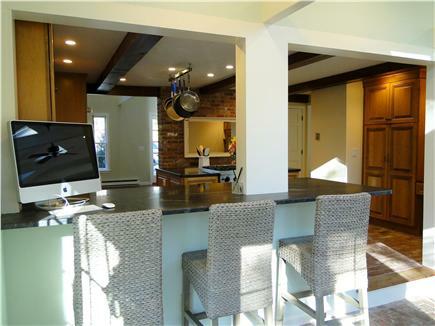 This special kitchen has brick floors, a wood beamed ceiling and bar seating for three. The dining room also features brick floors, exposed wooden beams, a beautiful view of the property, skylights, gas fireplace, and a custom oak farmhouse table seating up to twelve for memorable family meals. A large living room offers a fantastic gathering place with two couches, chairs, huge flat screen TV with cable and DVD for movies. A great place for family board games, puzzles or just hanging out. 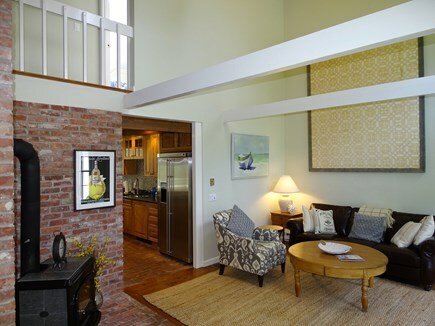 In the den, there is a large cathedral ceiling and exposed wooden beams with a comfy leather couch to enjoy reading, relaxing and conversation. A large Apple computer with high speed wireless internet access is available for your use. 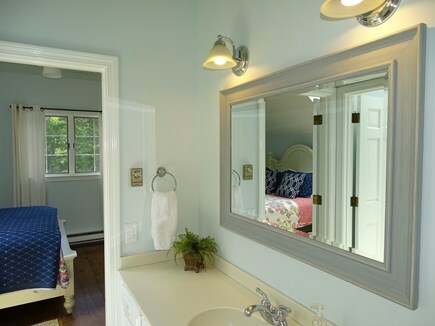 A private hallway leads to a spacious first floor master suite with lavish bathroom containing two sinks, a shower, private toilet and state of the art walk in closet. 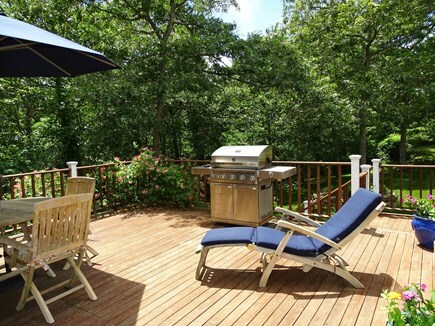 The master also has TV with cable and sliders which open to a beautiful outdoor deck. 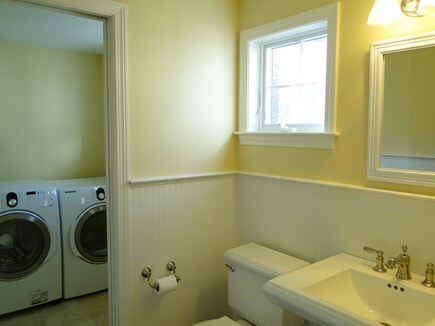 On the second floor are two large bedrooms with a Jack and Jill bathroom in between. 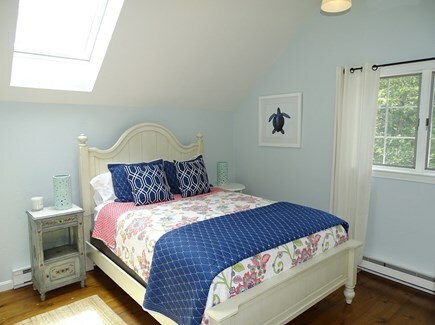 One bedroom has a queen bed with skylights and large closet. 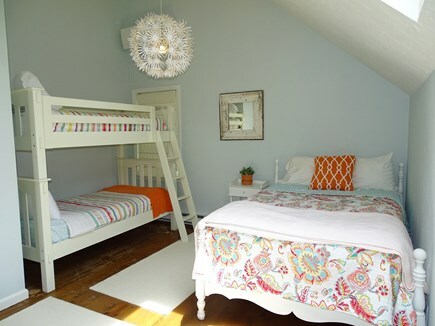 The other bedroom has a double bed, bunk beds, skylights and closet. 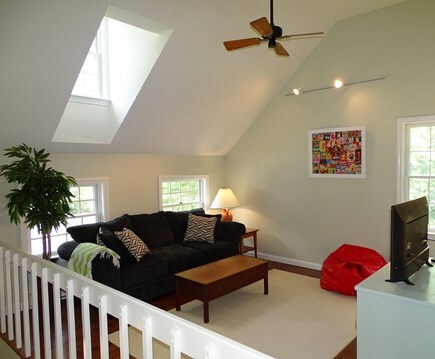 There is also a large loft with cable TV and queen pullout sofa--a great place for games and movies. 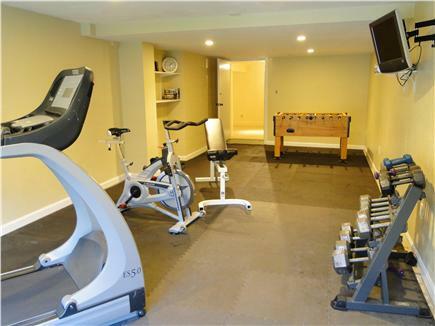 The fully finished basement offers foosball and an exercise room containing a spin bike, treadmill, weights, and cable TV. The house is equipped with Central AC, HE front loader washer and dryer, linens/beach towels and beach chairs are included. Additional pricing info: 3-4 Day Weekends(spring/fall) or Multiple Week Discount, State and local taxes of 14.45% will apply. 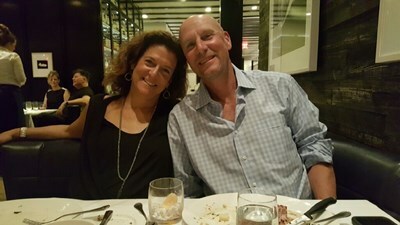 We vacationed in Barnstable, MA July 2018. We traveled with another family (10 ppl). Not only was the home was PERFECT for our group the amenities were outstanding. This is a MUST rent location. 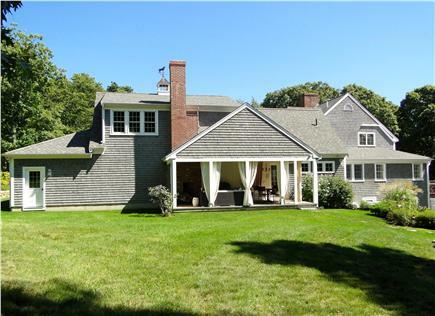 Close to many beaches (parking pass included for Barnstable beaches! ), Stop & Shop, Hyannis, Yarmouth etc. The home has 3 bedrooms and a loft with pull out bed. There is also a large area in the basement near the weight room where a few of the kids decided to sleep because it was very quiet. 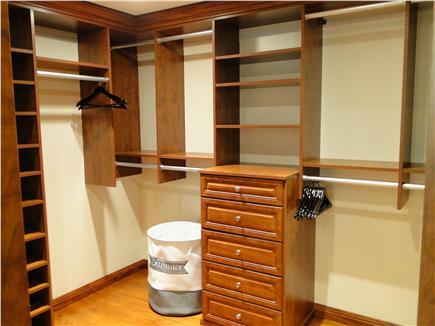 The 3 bedrooms are bright and have good space with ample closets to unpack. The beds are comfortable! 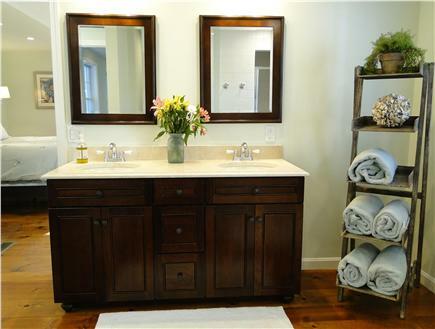 The home is updated, beautifully decorated and in excellent condition. The kitchen has excellent space and was well stocked with basic spices, sponge and liquid soap. Our favorite area was the covered porch out back. Great for morning coffee and an evening fire with S’Mores for the kids! Most important is that the Karen, the owner is quick and professionally responds to questions and needs. We will definitely stay here next year! 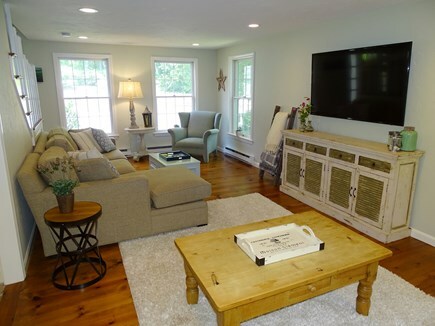 We loved our stay at this amazing house in Barnstable! The house is truly an entertaining gem. We traveled with 6 adults, two toddlers and a baby and this house was more than enough space for us. 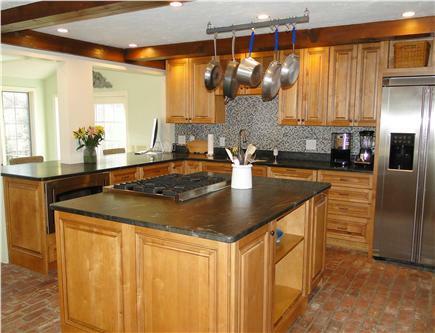 The kitchen is a cook's dream with a huge island, Viking stove and lots of space to prepare meals. We cooked a few meals and found pretty much everything we needed to do so in the kitchen. And it was great to be able to all eat together at the extra long dining room table. 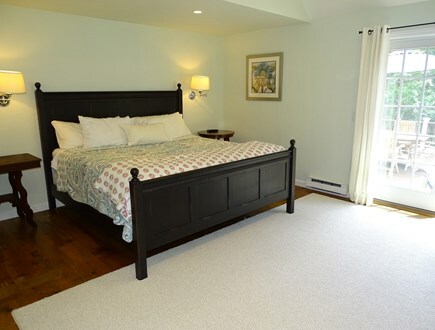 All of the rooms are a decent size, and the master bedroom is a huge, spacious room on the first floor away from the other two bedrooms that gives that room a little more privacy. 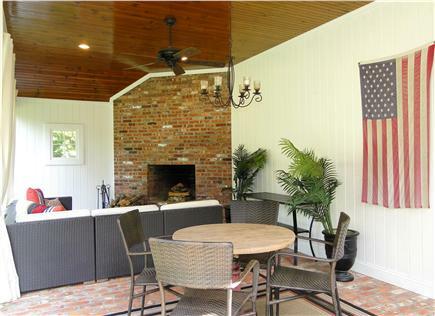 One of our favorite areas was the outdoor living room with the fireplace. We spent most of our nights out there as it was away from the bedrooms where the kids would not hear us. We would sit there for hours and enjoy the cool nights with a nice fire. The guys were all about the outdoor shower. Every day they each ended their beach day with an outdoor shower that was very refreshing. The rental also came with a beach pass that came in handy and saved us the $20 fee to get in to a lot of the area beaches. The house had multiple beach chairs and beach towels available and a full size washer and dryer which came in handy when traveling with kids. 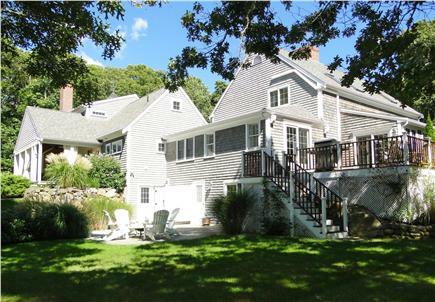 We couldn’t have asked for a better week on the Cape and a better house to rent for our vacation. We absolutely loved our stay and highly recommend this rental to anyone looking for a perfect vacation getaway house. From the moment we drove up the tree lined drive, we knew that our stay was going to be enjoyable. When our three kids saw the expansive property and the bunk beds, they forgot about the cloudy day and ran off to play. 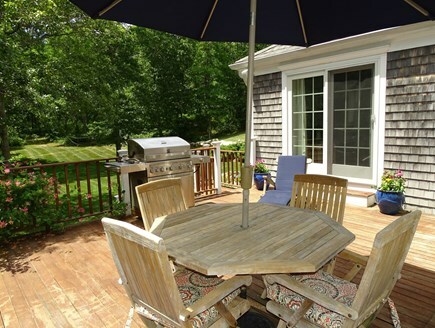 The property was a great fit for our vacation and provided an amazing place for us to relax and unwind when we weren't at the beach, in town, or generally just enjoying all that the Cape has to offer. This is by far the best rental I've ever experienced on Cape Cod. 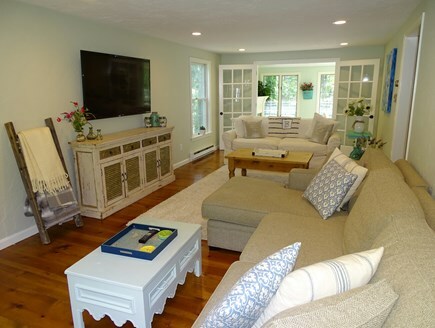 Karen and David's home is just that - a home - with everything you need to feel comfortable and worry free. The house is exceptionally clean. The kitchen comes fully loaded, including a Viking stove for any cooks out there. The beds and linens are comfortable. 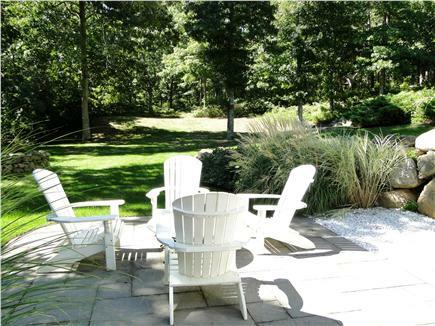 The house is set back and on a huge property so when you're lounging in the backyard, you just see greenery. There is an outdoor veranda with a wood burning fireplace which was awesome for smore's. There is a pond close to the house but Craigville Beach is about a 15 minute drive. When we were first beginning our rental research, Karen was extremely responsive and answered every question we had. She also checked in periodically to make sure we had everything we needed once we checked in. Loved staying at your house---it was perfect!! We were all so happy there---it had everything we wanted and needed. The house had plenty of room, and it was in such a private setting. The house was spotless and the kitchen had it all. I loved the dining room where all of us could eat together--very special. The yard was huge and gave us lots of space for the kids to play. All the different outdoor areas gave us great places for dinners, drinks or to just relax. We felt like we were in a home, not a rental property. The location is amazing and convenient to everything. Barnstable is so quaint --it gave us the real Cape feel. We all loved Millway Beach-- it's perfect for the children. Plus you'll never go hungry. There are many great restaurants to choose from. We have been vacationing on the Cape with our two daughters for over twenty years. We felt it was time to have a place to escape to as our family grows. We look forward to sharing our home with you and know you will have special vacation memories. After a long search for the perfect Cape house, we fell in love with this property because of its privacy, beauty and incredible location. Its size and open floor plan allows family and friends so many options to enjoy the best in indoor and outdoor living without leaving home. 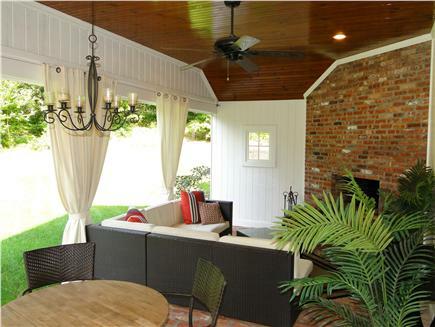 Our favorite place is the enclosed outdoor living room. Perfect for cocktails, meals, reading and relaxing. It's a must see!